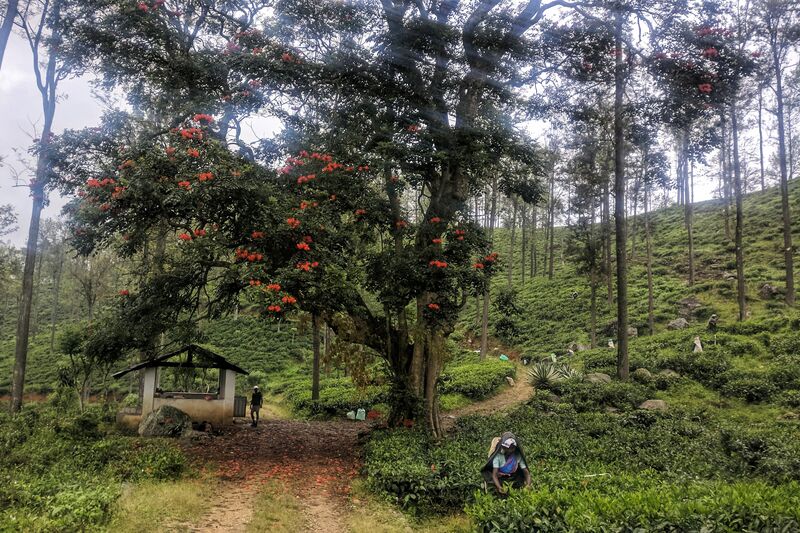 Tucked away in Sri Lanka’s central highlands a town named Ella sits at an elevation of 1,041 metres above sea level. 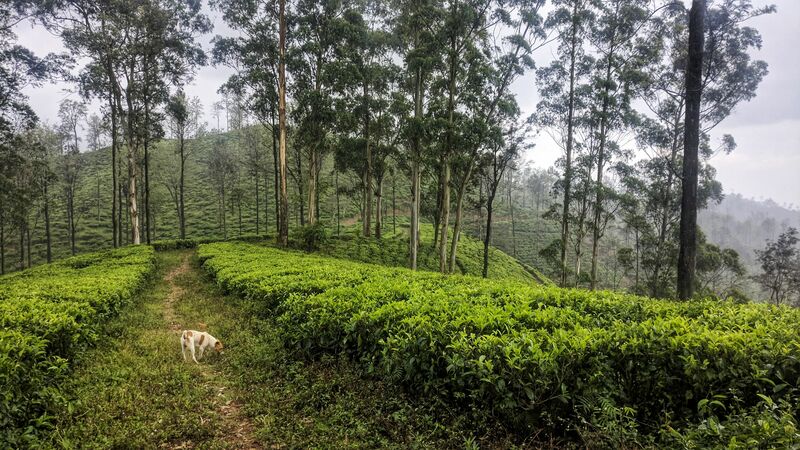 Traditionally this region has been known for its vast tea plantations, which is one of Sri Lanka’s biggest industries. These days this laidback town attracts backpackers and adventure seekers alike. 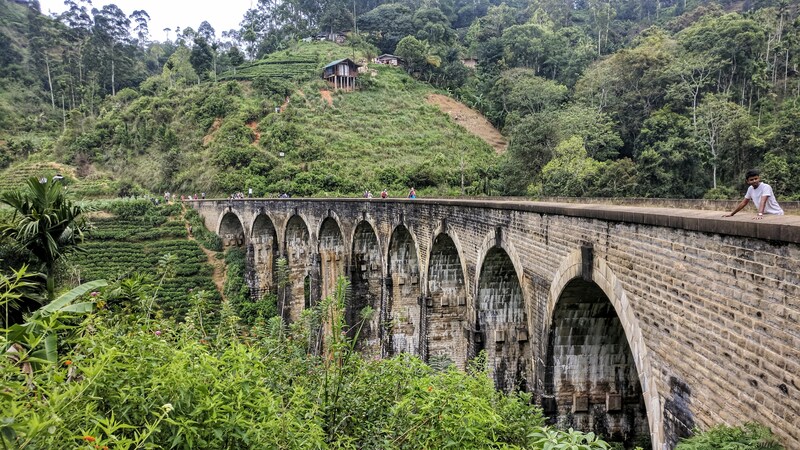 Stunning natural scenery, a growing food and nightlife scene and the famous Nine Arches Bridge have helped Ella to become a nailed on destination for tourists visiting Sri Lanka. 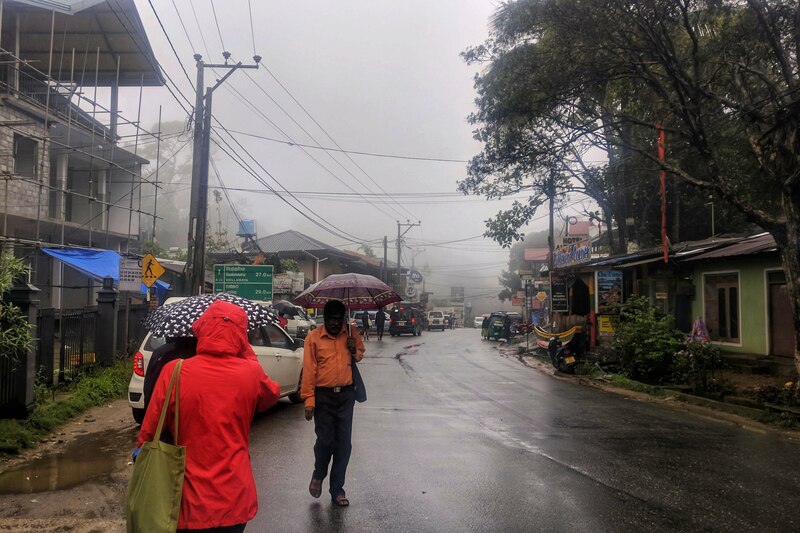 We arrived in Ella with the intention of staying three nights before moving onto Kandy. On the third day we extended it to five. There were two reasons that influenced our decision. Yeah… that was the main reason we kept the anchor down. 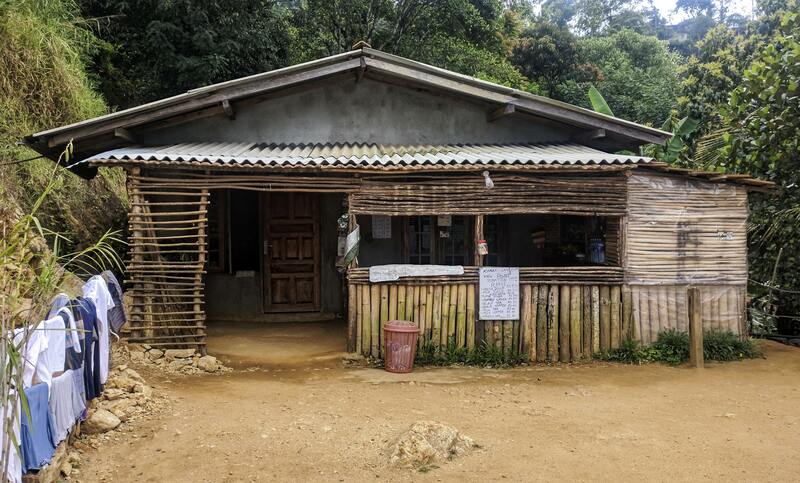 The violence had not reached Kandy city, but was happening in several smaller towns and villages in the district. Tensions continued to rise and there was every chance that the violence would spill into the city at any time. Thankfully that day never came, and the violence eventually fizzed out. With only 10 days in Sri Lanka this had the potential to spoil what had so farbeen a great trip. We faced a dilemma which meant altering our plans, or risk our safety by heading straight into the eye of the storm. 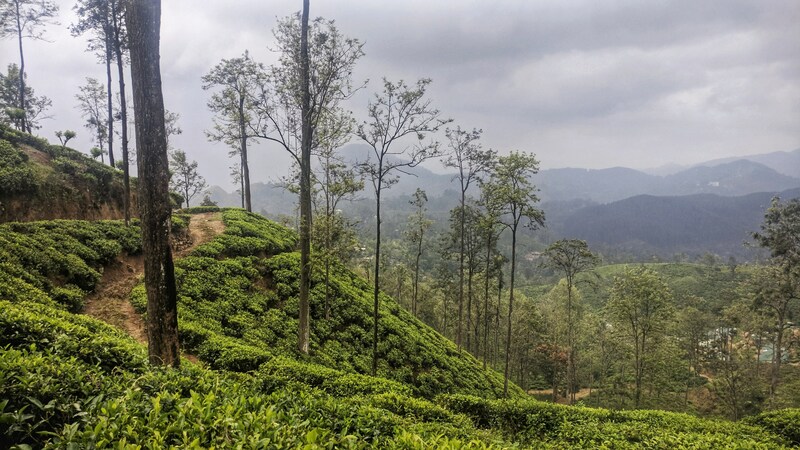 Our love for Ella assured us that our decision to stay an extra two nights and bypass Kandy completely was the correct one. The town itself is very small, so it’s quite easy to get from your hotel room to one of the town’s many saliva inducing restaurants. The town is nice, but has nothing to attract you other than its bars, shops and restaurants. The things that bring people here are scattered around the surrounding countryside. If you’re able, get out walking. Many of the main attractions are definitely reachable on foot. If you want to go a bit further there are tuk tuks waiting for you on almost every corner. Some people in our hostel rented a motorbike so they could explore by themselves. They said they encountered the most jaw-dropping views as they just set off in a random direction to see what they would find. Total freedom. We came to Ella to see nature, so we decided to stay outside of the town. The 1964 Boutique Hostel ticks that box and more, it’s about a 25 minute bus ride from Ella town with local buses running regularly at a cost of something like €0.20 (I can’t remember the exact price). We walked to the town once and it took about an hour and a half. I wouldn’t consider it “boutique”, there’s barely any WiFi, and the bed was about 6 inches too short, but everything else about this place was great! We tried to extend our stay but with only four bedrooms it filled up easily. 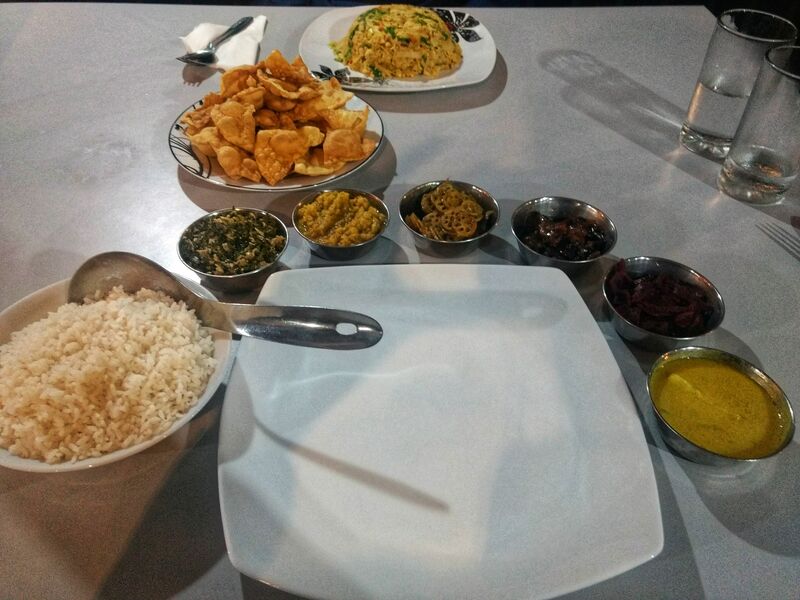 The hosts were so nice - they gave us free local tea and cooked amazing homemade Sri Lankan meals. They also had a tuk tuk service to bring us to places the bus didn’t go! At €10/night for a private room, how could you go wrong? There are so many things to do here. 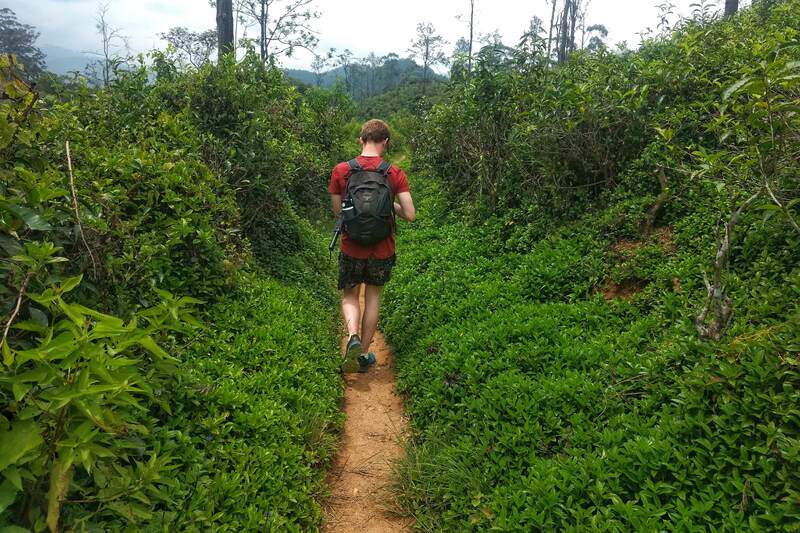 Just walking through the tea plantations could take up hours of your life. Time well spent. They’re just glorified hedges that you can drink, yet they look so damn good. Right behind our hostel (which was outside of the town) we were right beside fields and fields of tea. Going for a morning walk and being greeted with joy from all the workers out picking was one of our favourite things to do. The Nine Arches Bridge is a spectacular feat of engineering. 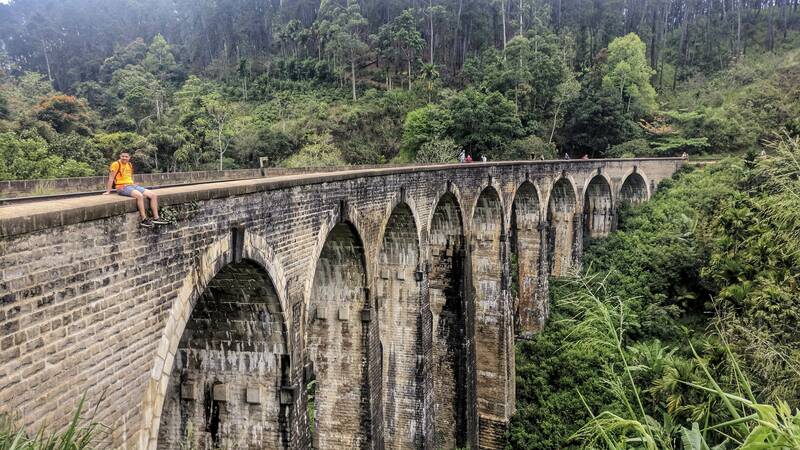 24 metres tall and 91 metres in length, it was constructed during the British colonial-era as part of a railway system that spans the length and breadth of the country. 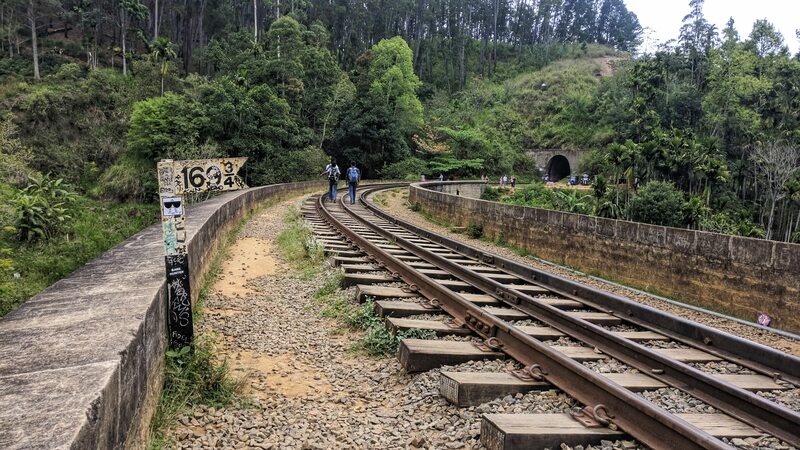 In its day the railway would have been used to mainly transport coffee and tea from the hills to the country’s main shipping ports. These days it welcomes the public too, offering some of the finest views on an extremely slow and packed train. To get here you will probably need a map of some kind, as the bridge can’t be seen from the roadside. We used Maps.me for Android, which uses OpenStreetMap data. Unlike Google Maps, OpenStreetMap data is crowdsourced, meaning any person like you or me can contribute to it. 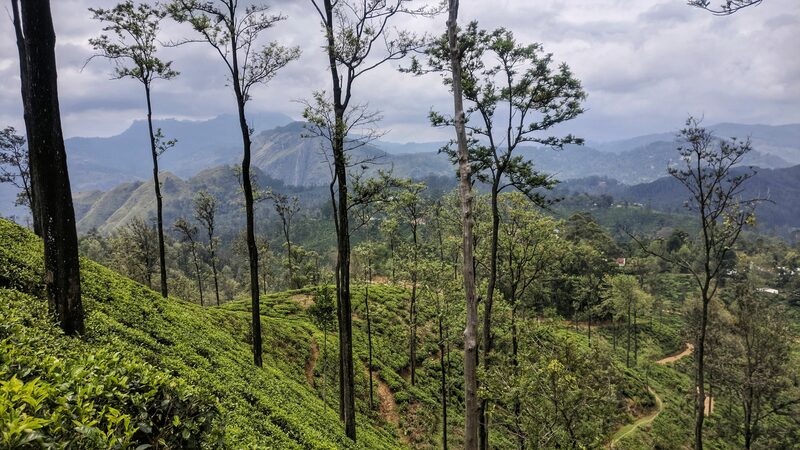 The route we chose brought us off the road and through the tea-plantations on a tiny dirt path to the bridge, which had us amazed. 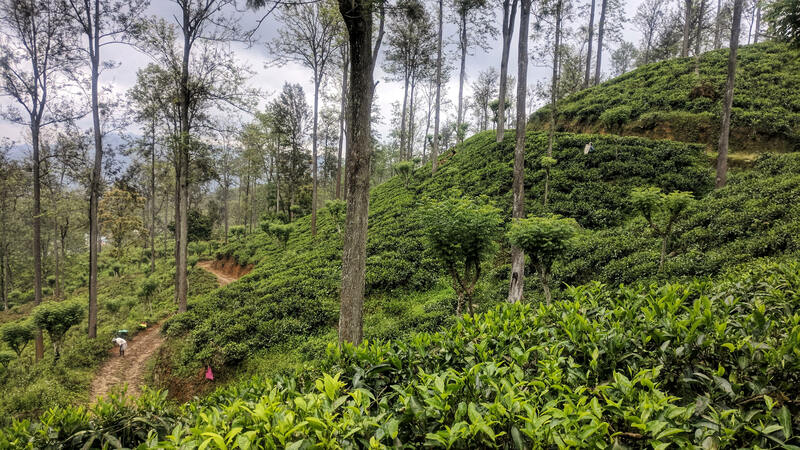 After a little while walking through the tea maze we came to an opening where a local man started trying to usher us in the opposite direction to the map route, saying “Bridge!” every now and then in an effort to reassure us. We were hesitant, but decided to trust him as there were some other tourists with him, en route to the bridge. He started bringing us a very long and unusual way, through houses until we weren’t really on a path anymore. We cut our losses and turned around in the direction we came from to go back on our original path, ignoring the man’s yells back at us. We met that same couple down at the bridge later, so at least he was actually bringing people there. My feeling is that he brings people this way so that he can ask for money when they come back! My advice would be to just ignore these people, use Maps.me and you’ll be fine. 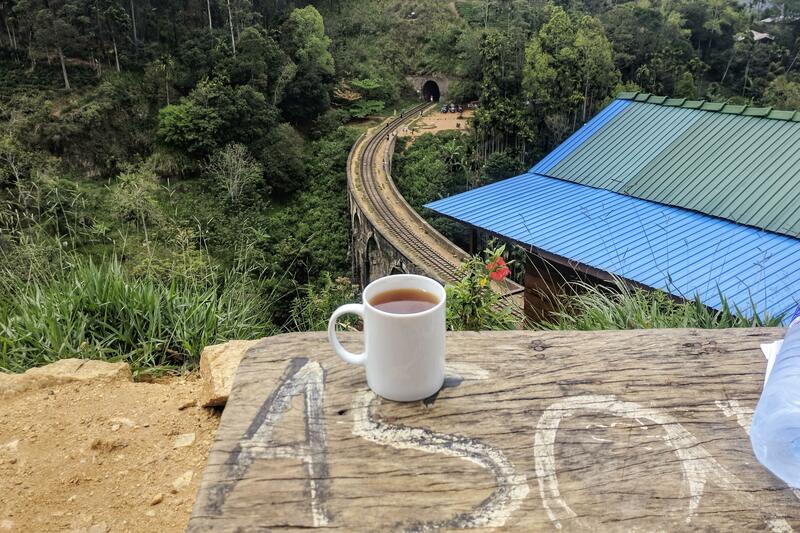 Before we got to the bridge, we came across a great viewing point with a simple little tea shop, where you can sit and sip on some local tea and wait for one of the five (I think) daily trains to pass. When we got here, a scribbled timetable told us that the next train was two hours away, so we didn’t wait for it. Be sure to check with your hostel before going if you want to catch one! Here’s the tea shop. Minimalism! 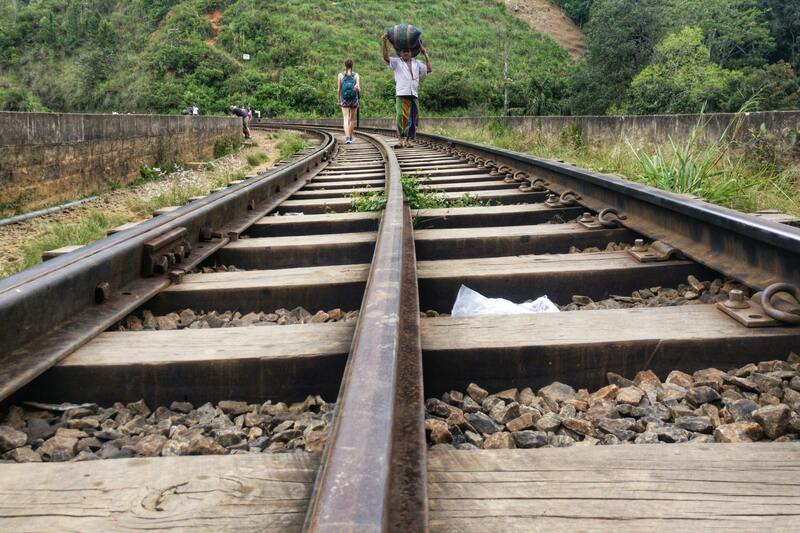 In Sri Lanka it’s common to walk along railway lines. The trains are so slow you’ve little chance of being hit! 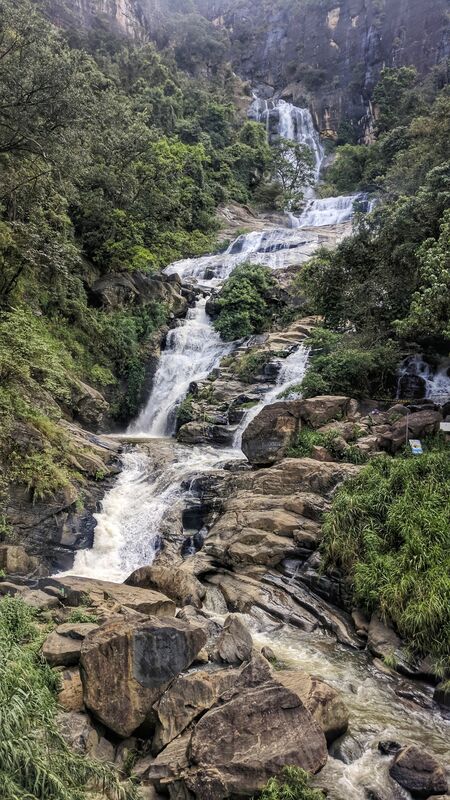 In Sri Lanka, the name Ella actually means “waterfall”. Standing 25 metres tall, the Ravana Falls is just outside the town. It is also one of the widest waterfalls in the entire country. We walked to these falls from the town. It took us just under two hours, though we took our time and stopped several times along the way to admire the views of the valley. Entry: Rs. 150-200. 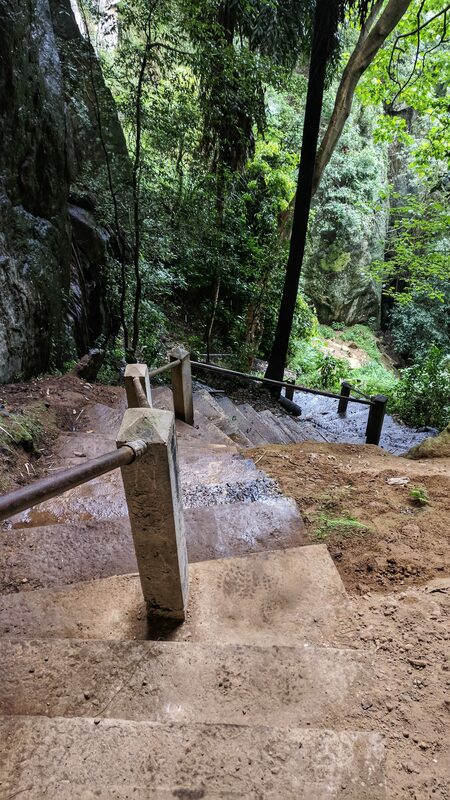 On the way to Ravana Falls, you may first want to make a small detour and head to Ravana’s Cave. 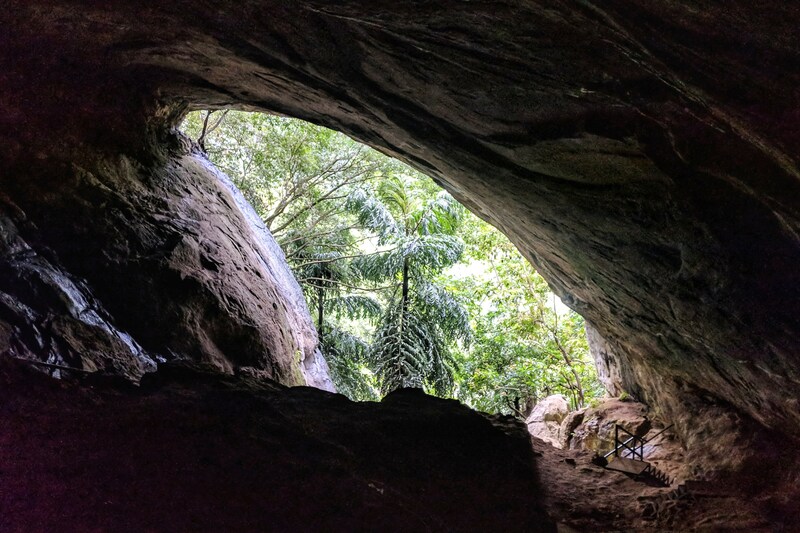 According to legend, KIng Rawana used this cave to hide the princess Sita. Even if that much is folklore, excavations undertaken in the cave revealed evidence of human habitation dating back 25,000 years! 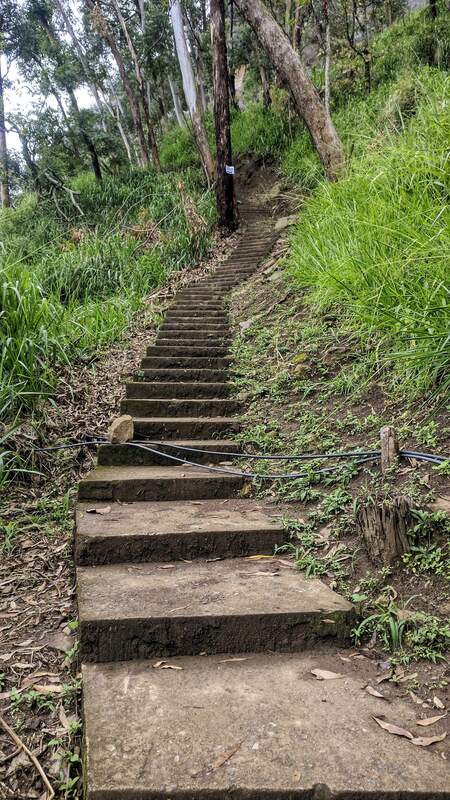 Prepare to climb some 650 steps to reach the cave. We enjoyed it, but it’s quite small when you get there so I’m sure many people are left disappointed at spending their money and sweat to see it. About 3/4 of the way up to the cave there is a hut selling coconut drinks. 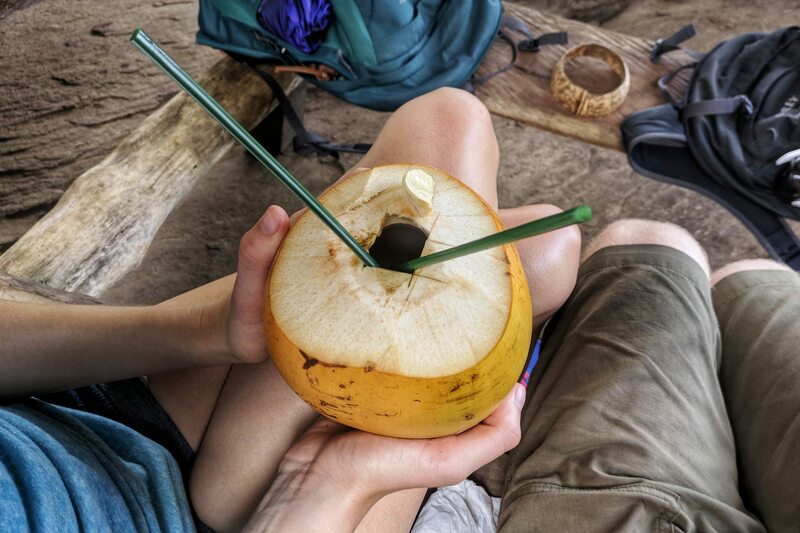 We stopped off on our way back down for a rest and to try a King coconut. 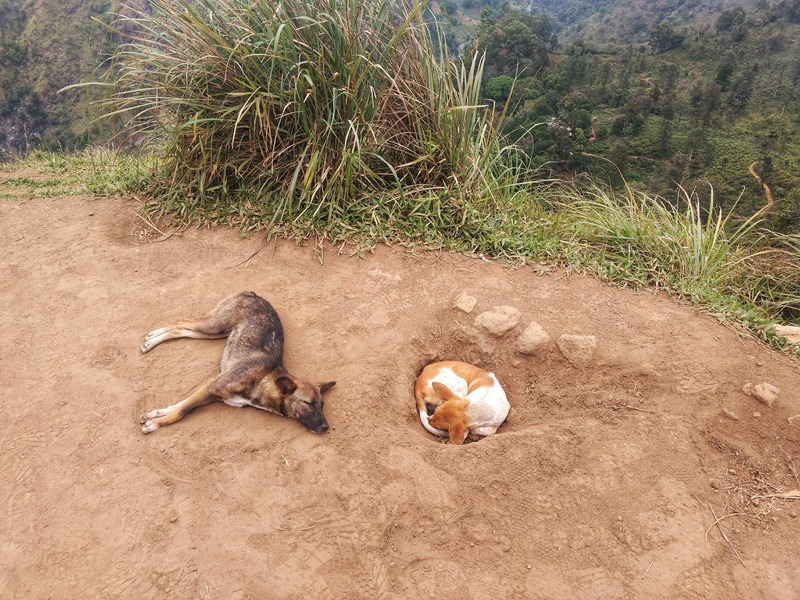 Little Adam’s Peak is a pretty easy hike. 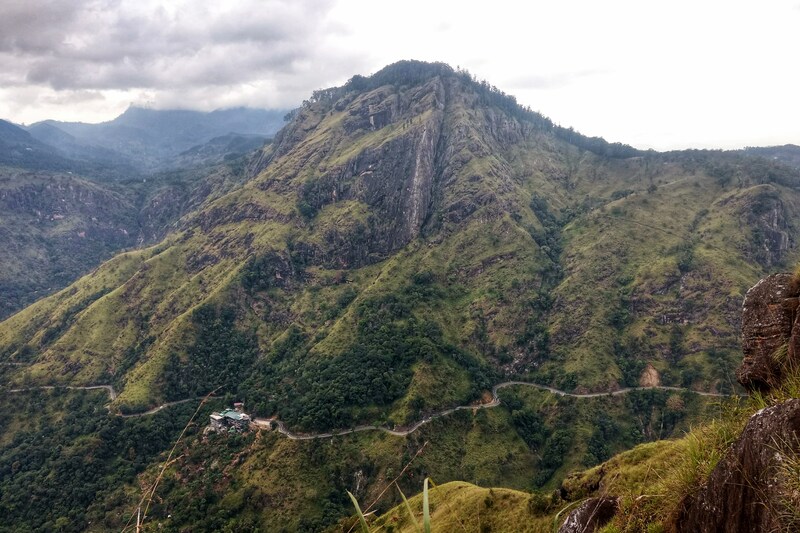 It attracts tourists and locals, who come to take in the spectacular 360° views from atop the 1141 metre high summit, which looks down on the valley below. To get on the trail leading to the top you must go to the 98 Acres Resort and follow the signs from there. It’s well signposted, you shouldn’t get lost. It wasn’t a very clear day when we climbed it, but the views were still amazing! 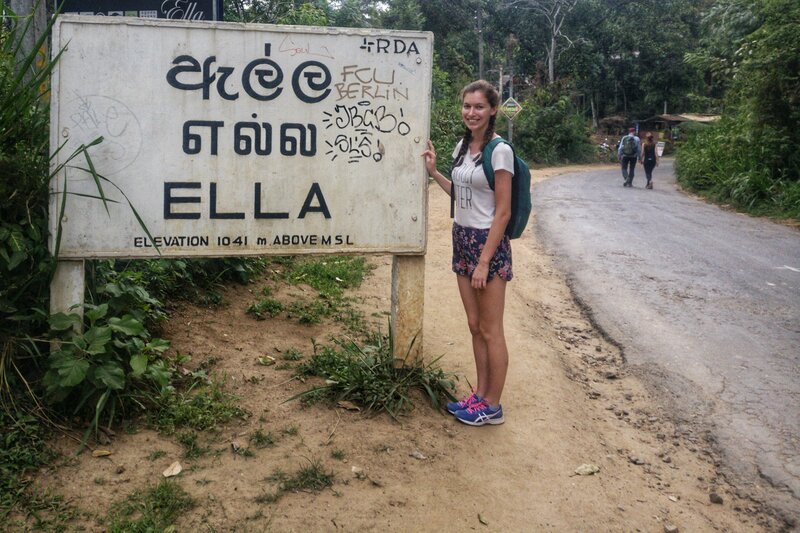 Goodbye Ella, goodbye Sri Lanka! 10 days wasn’t near enough in this country. 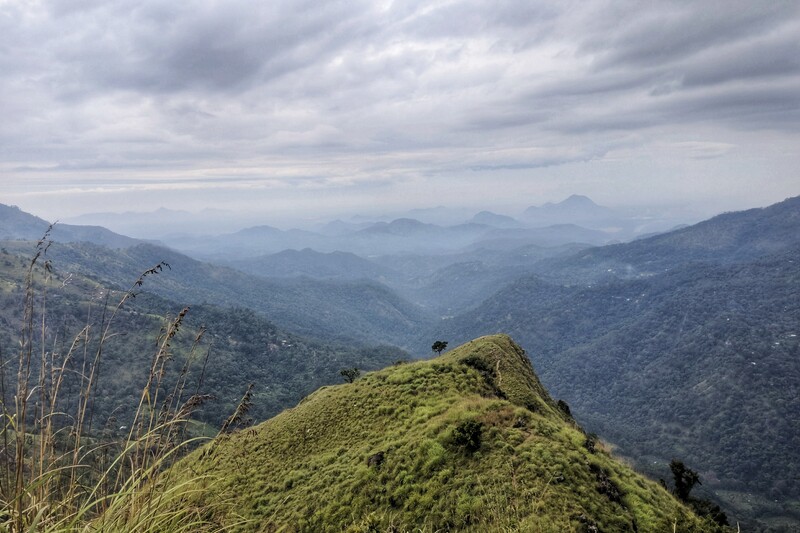 There were so many places we wanted to fit into our itnerary but just couldn’t, like Udawalewe National Park, Sigiriya and Lipton’s Seat. I guess that just leaves us with good reason to come back 😉! 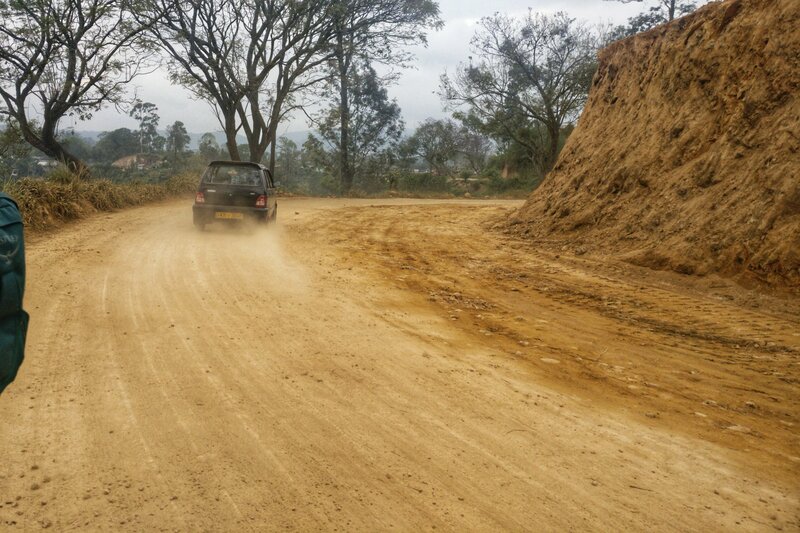 The lesson we learned from India and Sri Lanka is that slow travel beats fast travel. With that we decided to spend just over two months in Thailand (exceeding our visa and getting a fine). Be sure to check out my video, 2 Minutes in Sri Lanka if you haven’t already!